Jim always takes charge of the gravy-making. Pictured below is one of my favorite gravy boats, there is a space beneath the boat for a tea light that keeps the gravy warm on the dinner table. Place the roasting pan on the stove, across two burners if necessary to heat evenly. Loosen the pan drippings by scraping the bottom of the pan with a spoon. Add the stock and continue to scrap the bottom of the pan until all solids are loose. Bring the stock to a boil over medium-high heat. While stock is coming to a boil, melt the butter in a small sauce pan over medium heat. Add the flour and stir continuously with a whisk. Cook until mixture is a beige color, stirring constantly. Set aside. Once boiling, pour stock through a strainer into a medium pot, discard solids. Place strained stock on the stove and bring to boil. Add the roux and stir continuously until thickened. 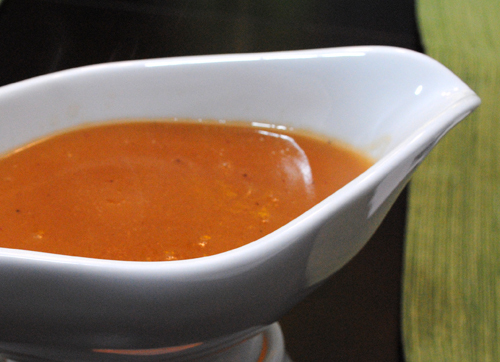 Serve gravy warm in a gravy boat to accompany Roast Turkey.